It has been a big week for us in terms of the ‘F’ of FACTS – feedback. On Monday, Ian had an article published in ‘People Management’ on the topic of ‘How to give challenging feedback’[no longer available online]. On Thursday, I delivered a short session on the topic of feedback to the leadership team of a major UK company that has recently gone through a significant merger to become the market leader in its sector. The CEO had given me the brief to ‘hold up the mirror’ to the team since I have worked with the company in various guises for the past five years – coaching individuals, facilitating team workshops and contributing to leadership development programmes. First I congratulated them on their ambition, their guts, their pursuit of courageous goals. At all levels of this global plc there is a commitment to courageous goal setting and the merger in the UK is a great example of this. Research by many commentators over the years has demonstrated that most mergers fail. In particular this research report from Booz Allen [no longer available online] suggests that between 40-80% of mergers fail to deliver the anticipated benefits. Hence the leaders of any company that commits itself to such a bold venture have to be prepared to put themselves on the line and prove the detractors wrong. Mergers are not SMART goals they are courageous goals. That was the good news. I could have left it there and let everyone retire for dinner to celebrate this achievement but if I had done that I would not have been ‘walking the talk’. I would have been letting them off the hook of another piece of feedback that was a little more challenging. ‘There is another side of the coin.’ I continued ‘A risk that if it is not tackled could yet squander the potential of this merger since you are only part way through the integration process. There are some elephants in the room that if they are not spoken about will undermine all the boldness of your original ambition’. I went on to feedback that I and my colleagues had observed that there is a tendency in the culture of the company to avoid confrontation and to put off giving honest feedback around behaviour and people issues. ‘Are we any different from any other company? Surely we all avoid confrontation.’ I was asked. To which I replied ‘You are different for two reasons. First you are in the midst of a merger and such undertakings demand that you grasp certain nettles quickly and decisively. Not all companies are in this situation. Secondly, you have an Englishness in your DNA which aggravates this tendency since we English relative to other cultures are polite, reserved and ‘dance around the handbags’ in a way that your colleagues in Holland would not do’. There was a pause in the room at that moment and I wondered if I had gone too far. I was suddenly in the ZOUD (zone of uncomfortable debate) with one of my most valued and important client relationships. I could sense the group weighing up my words and grappling with whether to take the feedback on board or push it back. It would come down to the reaction of one or two key opinion formers at that moment and I was very grateful indeed that the long silence was broken by an assertive voice saying ‘I completely agree with what John is saying’. I proceeded with the remainder of the session knowing that we had broken through to a new stage of the discussion. At the end of the meeting we were all able to retire for dinner both to celebrate their undoubted achievements yet also to get some real issues out on the table for a frank and challenging discussion. 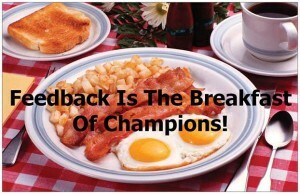 As Ken Blanchard once said ‘Feedback is the breakfast (and the dinner!) of champions’….